Whether you’re exploring Mason City as a visitor or a resident, there’s now an app for that! Visit Mason City recently teamed up with the City of Mason City and a group of students from the University of Iowa/Iowa Initiative for Sustainable Communities (IISC) program to design and develop a new mobile app – Embrace Mason City. With guidance from community partners, students in the Graphic Design VI course created the easy-to-use, community-based app. App content is organized into two categories – Things to Do and Community Info – which provide users with a variety of helpful information and resources. Local attractions, nearby restaurants, and upcoming events are all readily available within the palm of your hand. Cycling enthusiasts can navigate the city’s bikeway system and trails. Users can scroll through upcoming events and even flip through the pages of the Mason City Travel Guide..
All listings include location details and instant directions. Maps and public transit information are also featured; as well as access to the City’s SeeClickFix portal which allows users to report maintenance issues directly to City staff. 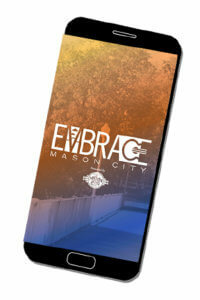 The Embrace Mason City app is available for free download from the iTunes AppStore and on Google Play.